Updated Android App: What's New? We have updated our Android app experience with improved design and usability, as well as some new functionality. This comes on the heels of the updates to our iOS and Windows apps, bringing a sleek modern design to our entire app suite, and creating functional parity across all our supported platforms. Familiar Android app design: The app was updated to conform with Google’s Material design concepts. This should make the app feel instantly familiar to most Android users, providing a more consistent app experience. Intuitive interface: The UI has been updated for a more modern look-and-feel, and to make all functionality more easily findable and accessible. Form Details & History: View any form’s metadata and change history, including timestamps for form actions (e.g. creation, transfer, completion) and the users who performed each action. Searching remote forms: Search for any form to which you have access — not just the forms on your device. All forms in your account are now at your fingertips, regardless of whether you are on a desktop or mobile device! Streamlined navigation: Most actions — from form creation to form completion to changing editor modes to form transfers to logging out — can now be accomplished more easily and efficiently. Use fewer taps to get where you’re going! Faster form creation: The form creation flow is more intuitive than ever. To create a new form, simply tap the floating action button at the bottom of the form list and choose a template. 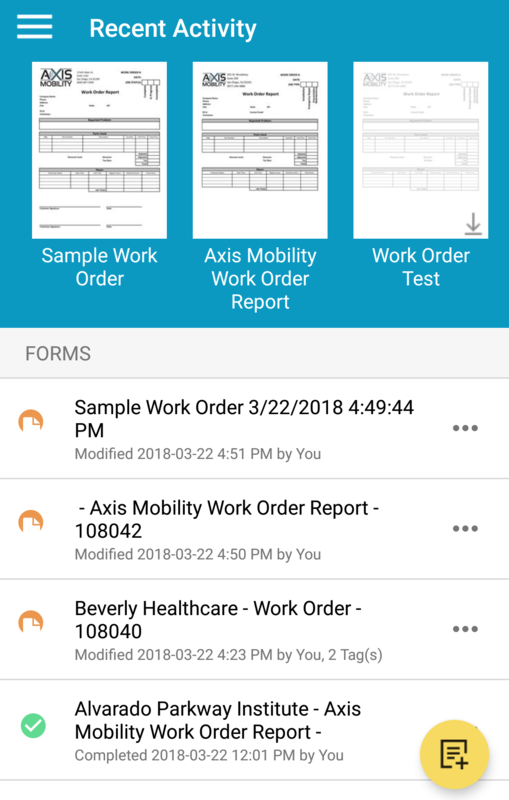 Check out the Android App User Guide for documentation of the updated app, including all new functionality and up-to-date screenshots.